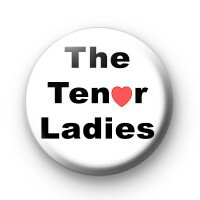 The Tenor Ladies badge in white with The Tenor Ladies written in a black font and the O of Tenor replaced with a love heart. These custom Tenor Ladies badges John Felgate. If you would like a custom badge design & need help with the design of your badge, please do get in touch with your requirements & we will be happy to help you. Standard 25mm badge made in our family workshop & available for worldwide delivery.